The visit to the church of Dodici Apostoli, or The Twelve Apostles, in the annual programme of the Station Church Masses is one with particular significance as it always happens on the Friday of Quattro Tempora di Primavera. This is one of a group of three days (Wednesday, Friday and Saturday in a week) that fall at equidistant moments throughout the liturgical year. The Spring days always occur between the 1st and 2nd Sundays of Lent. Throughout the centuries from the earliest times and especially in the early church, members of the public would pray in this church, on this day, for those who had been approved for ordination to the priesthood. Within the confessio, which means ‘Tomb of the Martyr’, are the remains of the Apostles, Philip and St. James the Lesser. Their remains were transferred to their present position after the original 4th century church was redeveloped in the 6th century. The new building was initially dedicated to these two Apostles but subsequently the dedication was changed to honour all Twelve Apostles. Other remains within the church, include those of the martyrs who had been buried at the Apronian catacombs. Pope Stephen IV is said to have himself helped with the transfer of the relics to the site, carrying them on his shoulders whilst walking barefoot. In its long history, the church has been associated with many remarkable names. Father Felice ministered in the Church for a time: he is remembered today as Pope Sixtus V. His name is seen frequently on plaques throughout the Eternal City as he was a key figure in redeveloping the city during the late 16th century when the medieval capital was enhanced with large churches linked by long, wide roads. 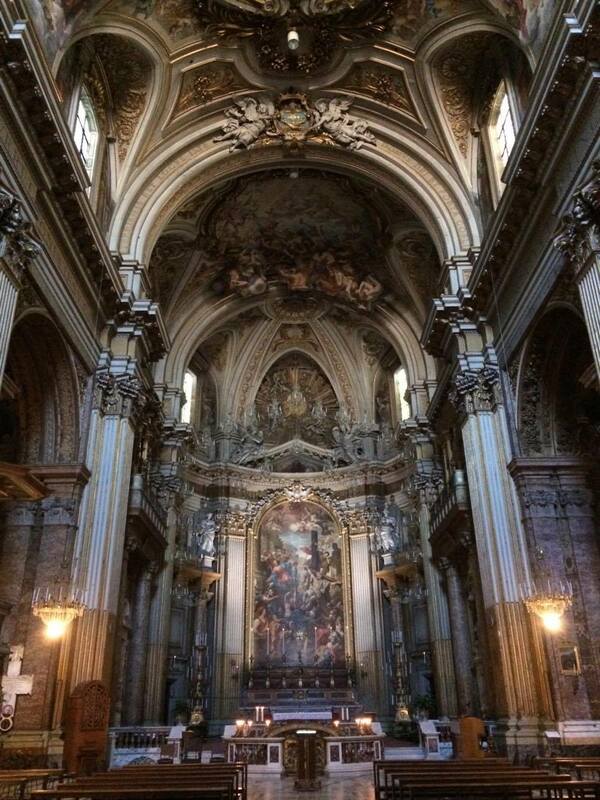 Michelangelo, another name synonymous with the Rome we see today, lived near to and worshipped in Dodici Apostoli. Upon his death he was interred within the church before his remains were transferred to his home city of Florence. The church itself has its own role to play in the history of Scotland. Following their exile from the United Kingdom, the Stuarts settled in a nearby townhouse, the Palazzo Muti Balestra, which still stands overlooking the piazza outside the basilica. The exiled claimants to the throne worshipped in Dodici Apostoli. Upon the death of Maria Clementina Stuart, the wife of the Old Pretender, James Francis Edward Stuart, her funeral cortege to the Vatican left from this church. Her heart is interred within the church. Her husband, lay in state upon his death in 1766 and their son, Henry Benedict Stuart, Cardinal Arch-Priest of St Peter’s Basilica and brother of Bonnie Prince Charlie was also Cardinal Priest of the church.